Kathleen Mary Latham was born in Richmond-upon-Thames in early 1880, the daughter of Thomas Latham, a barrister, and his wife Mary Harriet, née Doveton. Mary Latham died within three months of her daughter’s birth, her death was registered in the June quarter of the same year. Kathleen had one elder brother, Fenton Henry Latham, born in 1877. 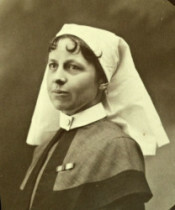 She trained as a nurse at St. Bartholomew’s Hospital between 1906 and 1909. Her home address during the Great War was ‘Stillingflete, Folkestone, Kent. She later became a member of the Queen Alexandra’s Imperial Military Nursing Service Reserve (QAIMNSR). In June 1919 the London Gazette records her award of the Royal Red Cross, First Class. Kathleen Latham died in 1954. 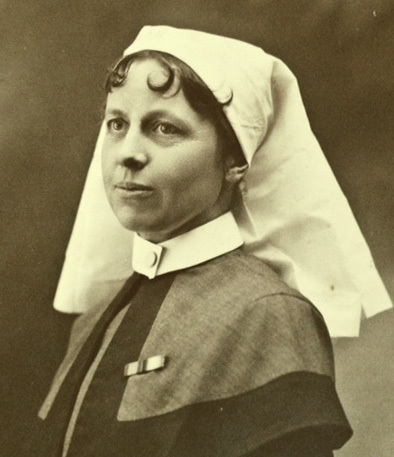 Sue Light has unearthed a letter from Miss K.M.Latham, a nurse on active service from the beginning of the war; the letter was sent back to St. Bartholomew’s Hospital, and published in the newsletter of the League of St. Bartholomew Nurses. It was written in 1916, but describes her experiences earlier in the war. She mentions that “Miss Appleton and I had adjoining cells, tiny white rooms, with texts in black printed on the walls ” and her account runs parallel to Edie’s diaries for the same period for 1915 (see Volume 1 and Volume 2 Part 1). Sure enough, Edie mentions Miss Latham on five occasions (8 April, 8 May, 8 September, 13 and 14 October 1915). Sue has a page with the full text, entitled A LETTER HOME FROM A CASUALTY CLEARING STATION, on her ScarletFinders website.